Whew. Is it May, or is it May? My head is spinning these days. Last couple of weeks of school, end of year parties, activities, and a whole lot of other things going on. You feel the same way, right? It's 4:24 pm, and I have about 20 minutes to write this post. I sure love y'all! For the next two weeks or so, the posts will be kind of scattered. I will post when I can, but I still want us to hang out together with our reading. Okay? Pinkie Promise? I don't want to be alone going through Philippians and Leviticus this month! A good place to start is our SHINE spotlight section. You will love hearing the testimonies of your sisters in Christ if you haven't already had a chance to read them. With all of that said, let's get straight to our Memory Verse. I needed a powerhouse verse to get me through this week and next. This verse is one of my favorites, and many of you probably already have it memorized. It's worth repeating this week--over and over. This verse has come to mean a whole lot to this little heart of mine over the past couple of years. When our little nephew came to live with us in 2012, I gave him this verse as his life verse. He says it makes him feel strong! I told him it is because he is strong because Jesus lives inside of his precious 7 year old heart. At 7 years old, he gets it. He gets the Power of God and how it infuses him daily. Sometimes I forget. 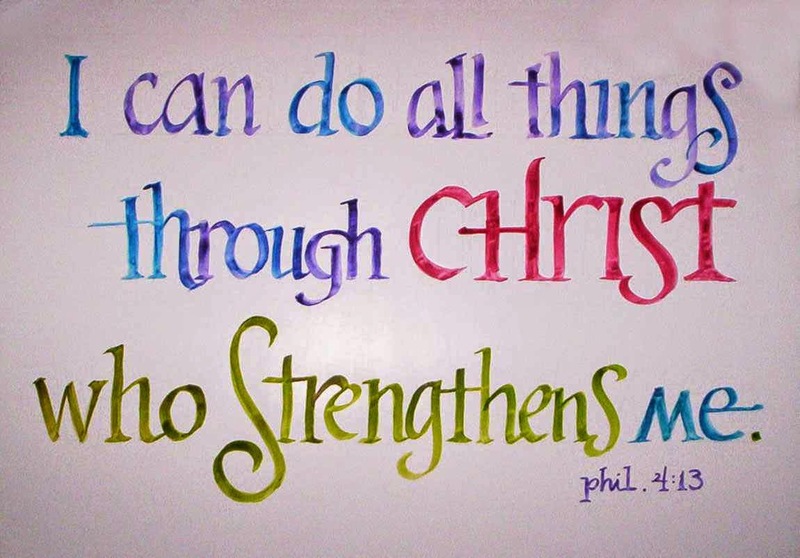 I forget that because He lives inside of me, I can do ALL things. Not just "some" things, but ALL things. As I type this, I envision your beautiful faces. Many of you need to know and believe this verse. Pick that pretty chin up and look to your Father in Heaven. He sees you. He does. He sees how you need Him. Trust Him to work in your life. Trust Him to do great and mighty things because His Spirit lives inside of you. Just today, I had to take a really deep breath and say, "Lord, I trust you to do this. I trust you." He can do it all, and He will.